Interior of the Chaturbhuj Temple from the entrance archway, Orchha. bl.uk > Online Gallery Home	> Online exhibitions	> Asia, Pacific and Africa Collections	> Interior of the Chaturbhuj Temple from the entrance archway, Orchha. Photograph of the Chaturbhuj Temple in Orchha, Madhya Pradesh, from the Archaeological Survey of India Collections, taken by Edmund William Smith in the 1880s. The area around Orchha was founded as a Rajput kingdom in the 10th century. In the 16th century the area was once again formed into a Rajput kingdom when the Bundela chief Rudra Pratap (r.1501-31) founded Orchha as the capital of the Bundela dynasty in 1501. The citadel is situated on an island in the Betwa river and contains three palaces: the Ramji Mandir, the Raj Mandir and the Jahangir Mandir. The Chaturbhuj Temple was erected by Raja Bir Singh Deo (r.1605-27) and dedicated to Krishna. It is an imposing temple with tall pinnacles built on a high stone platform. The exterior is richly ornamented with lotus symbols. The building displays a blend of religious and secular styles taken from temple and fort architecture. It is located on an axis with the Ram Mandir and faces east. 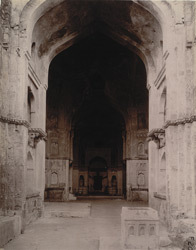 This is a view of the interior of the Chaturbhuj Temple from the entrance archway.